After she became coordinator of the teaching bilingual exceptional individuals graduate certificate program in fall 2017, Gliset Colon (pictured), assistant professor of exceptional education, worked to grow the program. First, she formed a partnership with Buffalo Public Schools (BPS) to work with the teachers the district had recruited from Puerto Rico. Thanks to that partnership, a number of BPS participants entered the program. Then, Hurricane Maria hit Puerto Rico. The hurricane devastated the island and sent thousands of Puerto Ricans to the mainland United States. Those teachers ended up looking to Colon for assistance in earning bilingual certification so they could work in the area. Between the teachers who sought Colon out after the hurricane and the teachers she works with through the BPS partnership, it’s been a busy year. 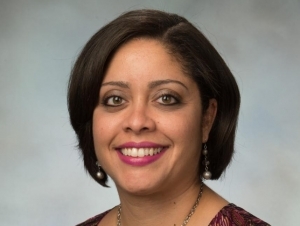 Colon, an alumna who started as an adjunct professor in the Exceptional Education Department in 2014, applied for the SUNY Faculty Diversity Program last year. She was nominated as the candidate for Buffalo State and received the Diversity Fellowship. That allowed her to be hired on a tenure-track faculty line in 2017. In New York State, the ability to speak Spanish alone doesn’t mean a teacher is a certified bilingual teacher. There’s coursework involved, centered on teaching practices for multilingual children, Colon said. While some teachers just need the certification, others are in need of a master’s degree, as well. Colon has worked with administrators in the School of Education in order to see what can be done to make certification easier for the teachers. The need for Spanish-speaking bilingual teachers in the BPS district has gone up since Hurricane Maria, Colon said. Over 500 students have relocated to Buffalo since the hurricane. “The need to provide the district with certified bilingual teachers is huge,” she said. The program had fallen by the wayside for a number of years, Paterson said, before Colon took it on. “Gliset, by just the virtue of her tenacity and persistence, has brought the program alive again,” Paterson said. For Colon, a Buffalo native whose mother came here from Puerto Rico, working with the teachers and helping them get on track has been rewarding.